The perfect slice of cake is often the best way to close a memorable event. Whether it be a wedding, a birthday, or another celebration, the cake can be just as important as the celebration itself. Nevadans, for your next special day, consider the following 10 cake shops, proven to bake with joy! The Courtyard Café and Bakery in Fallon, Nevada, is an award-winning bakery and restaurant serving pastries, breakfast, and lunch. The bakery always has a revolving selection of breads, cinnamon rolls, brownies, cupcakes, cakes, and more. Chef Flemming’s Bake Shop is a “European-style bakery” that was voted the 2009 Parents’ Pick by parentsconnect.com. They make incredible wedding, birthday, and special occasion cakes with European flair. 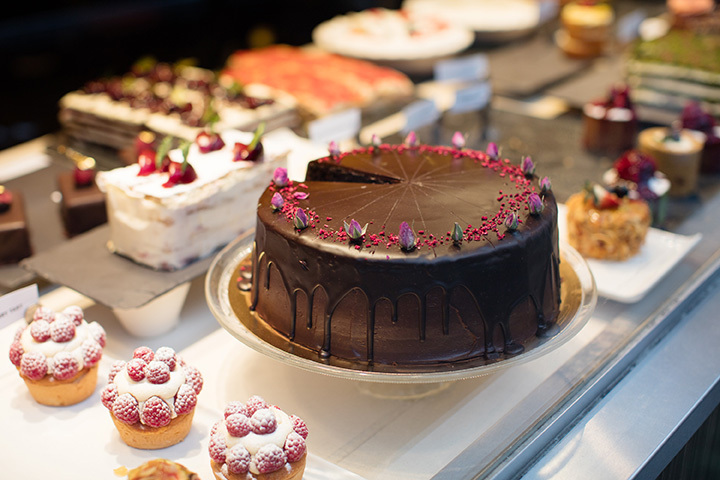 The L.A. Bakery Café and Eatery is known for their elegant, made-fresh pastries and cakes. They create tons of unique wedding cakes, regular cakes, and European style with an assortment of fillings, icings, and layers. For 11 years, Isabel’s has provided the community of Sparks, Nevada with delicious, freshly-baked cakes for all occasions. They’re happy to design brand new cakes based on your specifications. Freeds Bakery has been a Las Vegas tradition since 1959. Now in its third generation of family ownership, Freed’s cakes are exquisite and seasonal. They’re happy to make unique cakes to your specifications, including a 007-themed cake, and more. Las Vegas has a ton of… well, everything, and that includes cake shops. We’d be remiss not to include Las Vegas Custom Cakes—a shop that offers many of the most gorgeous custom cakes we’ve ever seen. If you can imagine it, they can make it. Check out their gallery online. The team at Delicious Designs aim to make cakes that taste “as beautiful as they look.” And their cakes are quite beautiful. Their cakes are made from scratch, and include flavors including lemon curd, lemon lover’s, mimosa, mint chocolate, chocolate L’Orange, champagne raspberry crème, and many more. Creative Confections by Sarah in Fernley, Nevada, is one of Fernley’s best cake spots. They specialize in cakes, cupcakes, and cake pops for every occasion. Carlo’s Cake Shop is famous for its many appearances on “Cake Boss,” the television show. Opened originally in 1910, the current bake shop has locations in New Jersey, New York, Pennsylvania, Texas, Florida, Connecticut, Minnesota, and Las Vegas, Nevada, among others. If you’re a fan of the TLC show, then it’s definitely worth considering. Their options are delicious. Tahoe Cakes by Grace is the recipient of many awards, including Wedding Wire’s Couples’ Choice Awards several years running. Grace has been in business for almost ten years, although she’s been making cakes for over 40. She offers cake truffles, mini cupcakes, specialty cakes, groom’s cakes, cupcakes, and cake pops. View more Nevada Bakeries and Pastry Shops.